DON’T SPEND A FORTUNE TO LOOK FLAWLESS Esthetician to the stars Raisa Ruder learned her time-tested beauty techniques from her Ukrainian grandmother (or babushka, as they say in the old country). Now everyone can discover the all-natural, better-than-botox secrets the Hollywood stars use to shine on the red carpet! Ruder reveals her sought-after beauty recipes that can fight wrinkles, plump lips, and eliminate crow’s feet and acne, using inexpensive, everyday grocery items like eggs, honey, vegetable oil and strawberries (and a splash of vodka for freshness!). 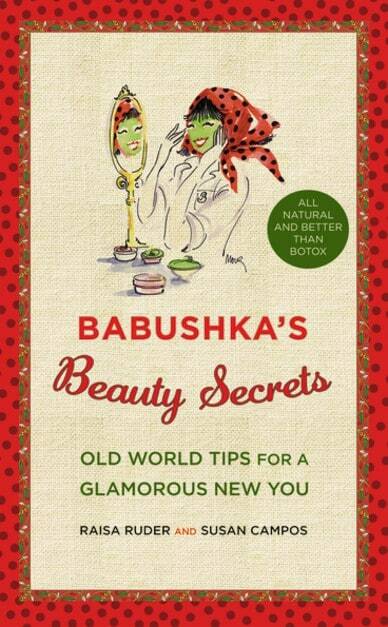 I didn’t have an Old World â€œbabushkaâ€ in my life, so when I received Babushka’s Beauty Secrets: Old World Tips for a Glamorous New You, I was pretty anxious to try out some of the recipes. Unfortunately, I didn’t have many of the necessary ingredients on hand, so I was limited in what I could try out until I went grocery shopping. However, it won’t take much to stock up on ingredients, as the recipes call for items like grapes, strawberries, buttermilk, oranges, bananas, and avocadoes. On the first night, I tried the honey face moisturizer (which is precisely what it sounds like). I was a little hesitant, worried that the honey would be impossible to remove, but it wasn’t at all. And, my face was super smooth afterward. According to the book, honey will keep your skin young and healthy. Sounds like a winner! The other thing I tried was the White Knight, an egg white mask. As recommended, I saved the yolks for the Incredible Egg Conditioner, which advises that two egg yolks mixed with a teaspoon of olive oil will make my hair very shiny. I cannot wait to try that! But, back to the mask. I can say that it was not messy and felt like a store-bought mask. My skin was tight after I removed it, which was easy. Considering that my commercial mask contains stuff like dye and perfume (not to mention chemicals that I can’t even pronounce), I feel a lot better knowing something natural (and cheap!) is on my face. The White Knight left my skin tight and firm, like I’d had a facelift. Yay! The book is charming. I am anxious to try out a bunch of other recipes (I have way too many pages dog-eared), which I will probably be doing every day til I exhaust them all. My list includes the Apple Infusion lip conditioner, the Dry Hair Eraser, and the Cocoa Mask. The thought of pampering myself a) at home, b) using all natural products c) without spending a fortune is just so delightful. I might share what I’ve learned, but I surely won’t share this book! Since I am of Polish descent…I even know what a Babushka is. lol thanks. Would love to try some of the beauty recipes! I LOVE this giveaway!! Please enter my name. Thankyou!! I love beauty related books!! Sounds like a fun book, I’d love to try making some all natural products!